Twenty years ago this week, Bill Gates sent a lengthy internal memorandum to senior staff at Microsoft Corporation, announcing an embrace of the Internet that was to help shape the digital landscape of the second half of the 1990s. The memorandum confirmed that Gates and Microsoft were late in recognizing the promise of the Internet and helped prod the software giant to confront the swaggering upstart, Netscape Communications Corporation, maker of an eponymous and highly popular Web browser. 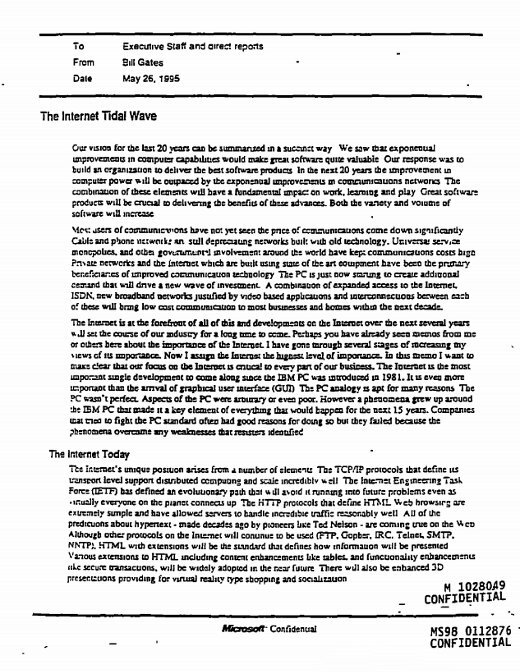 The memorandum was dated May 26, 1995, and bore the title, “The Internet Tidal Wave.” It surfaced a few years later in the U.S. government’s antitrust lawsuit that accused Microsoft of uncompetitive practices in vanquishing Netscape in the “browser war” that began later in 1995. “The Internet Tidal Wave” in recent years has been called “an epic manifesto of sorts,” but it embraced many of the themes that had been reverberating for months in Silicon Valley. Not only was the memorandum an acknowledgement that Microsoft needed to catch up quickly, it confirmed that Gates’ thinking about the Internet had been off-target. 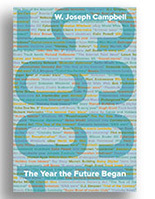 As I note in my latest book, 1995: The Year the Future Began, Gates “mistakenly thought the Internet was just a precursor to some sort of elaborate, multidimensional information superhighway. He said as much in his 1995 book, The Road Ahead. “But as Netscape’s browser demonstrated, the Web was becoming the information superhighway,” I write in 1995. “And the browser’s potential as a platform for software applications represented an undeniable threat to Microsoft’s Windows operating system.” Marc Andreessen, the young co-founder of Netscape who sometimes was called the “next Bill Gates,” supposedly boasted that Netscape would reduce Microsoft’s Windows operating system to a mundane set of poorly debugged device drivers. Gates’ memorandum represents an intriguing and rather detailed assessment of the state of the Internet, and its emerging capabilities, in 1995. Gates identified Netscape as a threat, referring to the upstart as a “new competitor ‘born’ on the Internet” whose Web browser “is dominant, with 70% usage share, allowing them to determine which network extensions will catch on. … They have attracted a number of public network operators to use their platform to offer information and directory services. Of course it did not significantly alter antitrust laws, which a federal court found that Microsoft had violated in taking on Netscape during the second half of the 1990s. The federal government in 1998 brought an antitrust lawsuit against Microsoft, claiming the company had engaged in an anticompetitive practices by bundling its Web browser, Internet Explorer, with Windows 95 operating software. Doing so placed Netscape at a competitive disadvantage, as the government charged and a federal judge agreed. The ruling came in April 2000, too late to save Netscape. By then, the trajectory of its meteoric rise and fall had been completed: Netscape had decisively lost the “browser war” to Microsoft and in November 1998 was acquired by America Online. This entry was posted on May 24, 2015 by W. Joseph Campbell in 1990s, Anniversaries, Early Web, Internet, Netscape, Technology, Watershed year, World Wide Web and tagged 1995, Bill Gates, Early Web, Internet, Microsoft, Netscape, Watershed year, Windows 95.